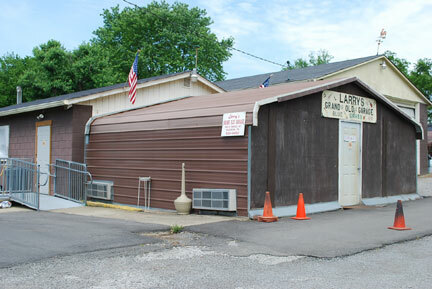 Larry’s Grand Ole Garage & Bluegrass Music Park is located in Madison, Tennessee at 549 East Maple Street. From I-65, head east on Old Hickory Blvd. to Gallatin Road. From Briley Parkway, head north on Gallatin Road. Travelling south on Gallatin Road, make an immediate left (there is a light and left turn lane) onto Old Old Hickory Blvd (Kroger’s is on the right and Reese’s food store is on the left). Head east on Old Old Hickory Blvd for approximately 1/2 mile and turn right at Forest Park Road. Turn left at the next street (East Maple Street). Go to end of street where it ends at Larry’s Grand Ole Garage on the left. Travel north on Gallatin Road for approximately two miles. Turn right (there is a light) onto Old Old Hickory Blvd (Kroger’s is on the left and Reese’s food store is on the right.). Head east on Old Old Hickory Blvd for approximately 1/2 mile and turn right at Forest Park Road (Grand Slam Market is on the corner. ).